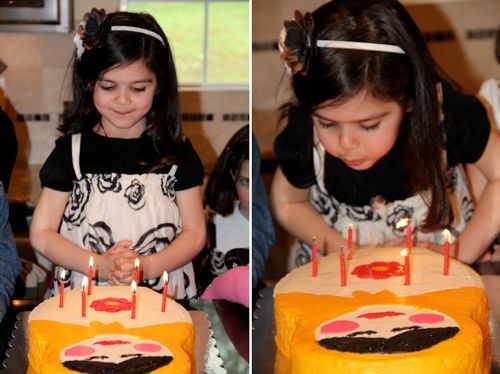 On April 20th our little "Chiquita" turned six years old! I had originally planned to let her invite a few friends to celebrate this year, but since a couple of her best friends just moved far far away, and since it ended up being during Holy Week this year, I decided to perhaps put her "friends" party off until her 7th birthday. However, after seeing how cute everything was coming together, and not knowing what next year will be like, I decided to just go for it and called up a few of her friends at the last minute. It ended up being such a fun little party! 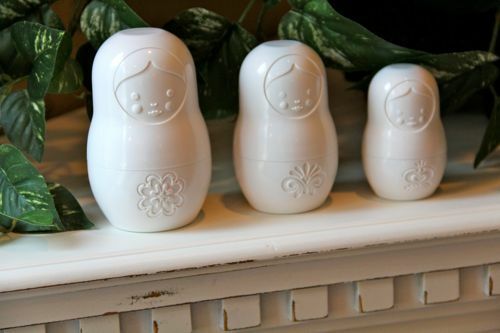 My girls' first introduction to Nesting Dolls was this past Christmas when we received the cutest measuring cups ever from a friend. They just loved them and Chiquita decided that this had to be the theme for her next birthday. 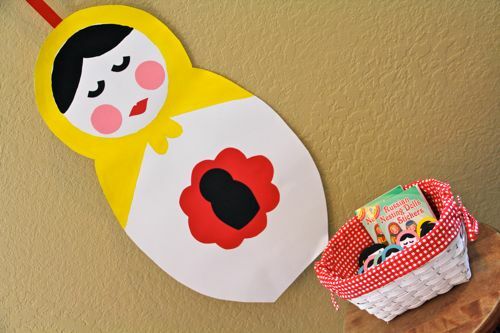 I looked for some ideas online, but my inspiration ended up coming from the sweet little book The Littlest Matryoshka with its matching set of dolls, and from the Cricut Cartridge, Paisley (which has four different templates for Nesting Dolls). I had also purchased another book called The Magic Nesting Doll (which is a Sleeping Beauty in reverse type fairy tale - the girl wakes the prince), but I decided to save that to use as a Christmas gift and perhaps order the dolls to go along with it as well!
. 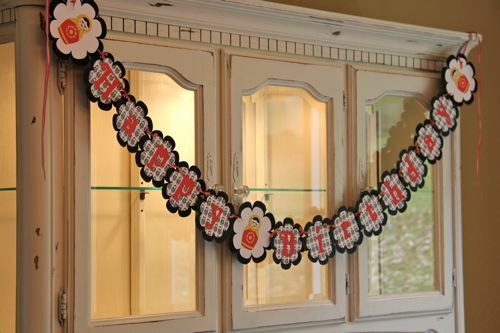 : A Nesting Doll Happy Birthday Banner :. I created this banner using my Cricut with the Paisley (Shapes and Dolls) and Winter Woodland (Font) Cartridges. I also created some of my own paper (with the tiny black nesting dolls, using copyright free images online and printing it in grayscale - my document can be found here) and tied it all together with some red and white gingham ribbon.
.: The Littlest Matryoshka Coloring Pages :. 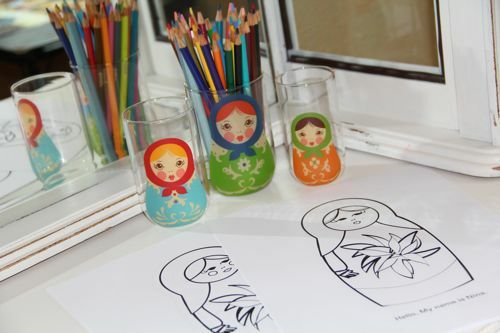 I also printed out a worksheet to Finish Drawing the Matryoshka Doll! 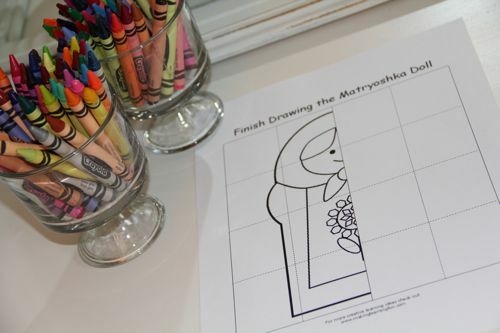 Other coloring page options include this Nesting Doll Dot-to-Dot, a set of Three Nesting Dolls from Outside the Lines, and these printable Russian Dolls from Activity Village.
.: Decorating Matryoshka Doll Cookies :. 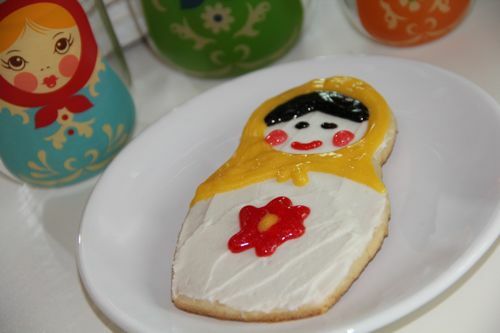 I had white frosting, a variety of cookie icings, sparkle gel frosting and sprinkles for the children to use for decorating.
.: Nesting Doll Memory Match :. 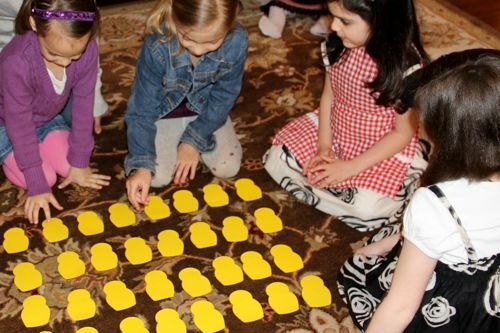 Next the girls played a game of Nesting Doll Memory match! 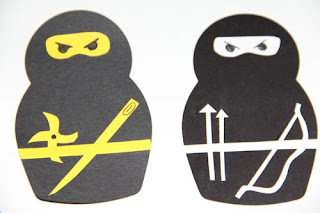 My Cricut came in very handy as I quickly cut out nesting doll shadows to use for the playing cards. 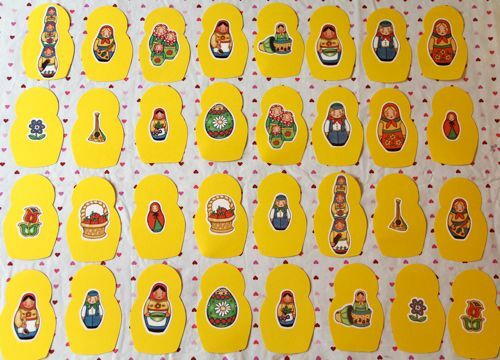 I then used two of each Russian Nesting Dolls Stickers (Dover Little Activity Books) for the images. It turned out really cute!
. 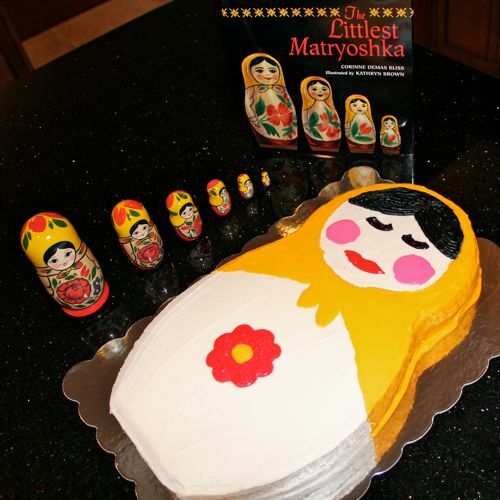 : Place the Littlest Matryoshka inside the Babushka :. After creating the banner the weekend before her birthday, I stayed up late making this game as well. I used a dinner plate to trace a circle for the head and then drew one side of the body of the nesting doll, cutting it out and then using what I had cut off as a guide for the other side, making sure it was symmetrical. I then painted on a scarf and the hair with acrylic paints, and then cut the rest our of paper. I just loved how it turned out, and it ended up inspiring me on how I would decorate her cake! 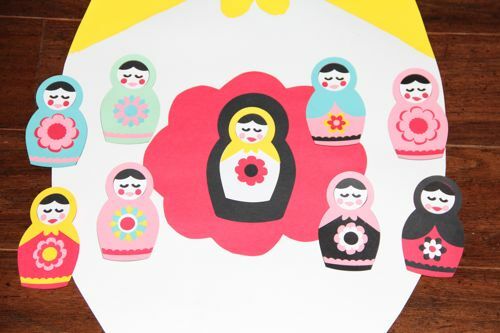 Using a variety of paper colors along with the four different designs provided on the Paisley Cartridge, I made small nesting dolls for each of the children to place inside the large nesting doll for a "Pin the..." type game! 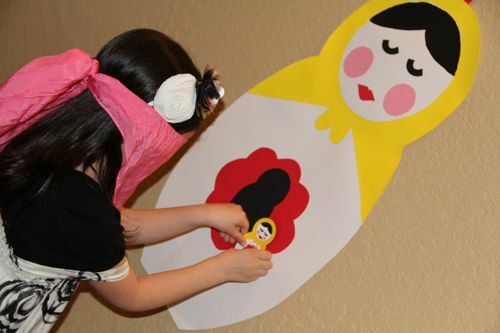 We used the girls play silks, to match the scarves on the nesting dolls, as blindfolds! 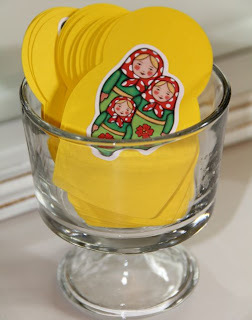 I used a couple more of the Russian Nesting Dolls Sticker Books as prizes.
.: The Littlest Matryoshka Nesting Doll Birthday Cake :. I posted about her birthday cake on her birthday, but I'll include the pictures here anyways, for those of you that missed it. . . I made the cake by cutting off one end of a 13" oval pan (the body) and cutting out part of a 8" round pan (the head) so they would fit together nicely. 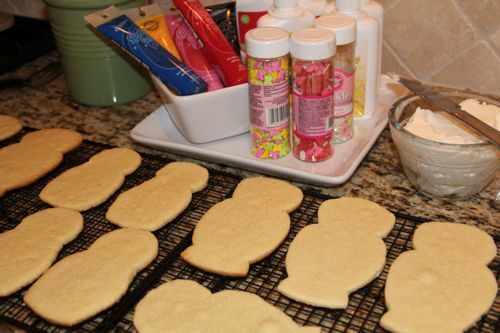 After frosting it with white buttercream, I outlined the face (using the rim of a 6" round cake pan), cheeks (using a small cup), and the rest freehand with a toothpick, before decorating it with the various color icings. I didn't think there would be any way to top the cake I made for her last birthday, but she loved it just as much! 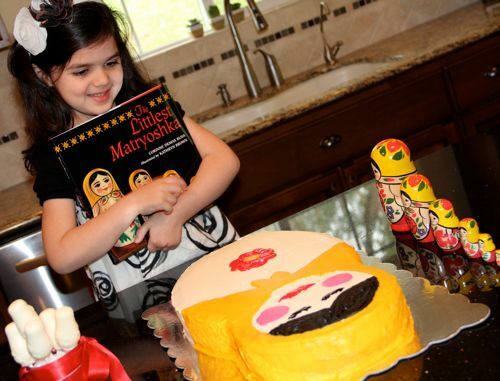 In addition to her new nesting doll and book, Chiquita received a stack of six gifts from her family, and a couple other darling gifts from her friends! 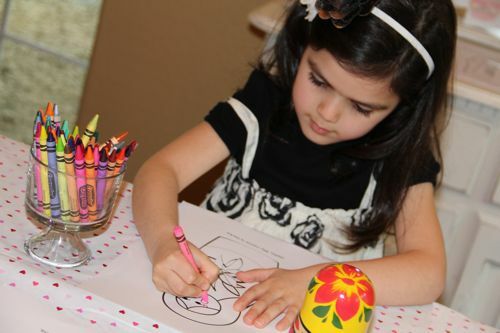 Chiquita is working on her thank you cards now, using the Masha and Friends: Matryoshka Notecards.
.: Party Favors - Nesting Doll Lollipops :. 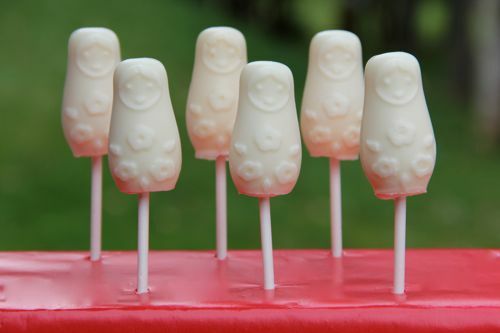 Using White Candy Melts and this great little Babushka Doll Ice Cube Tray as a mold, I made each girl a Nesting Doll Lollipop as a party favor. Cute, cute party, Jessica! What great memories she'll have. I LOVE theme birthdays! This is really great. I love that you thought of everything, even the boy figures for the game, which would be important at our house as well. Really cute! Good Job! What a great and unique party! I love themes too! You did a super job! This one should be in a magazine!! My 4 year old is almost 5 but keeps changing her themes....we are at "horsey" now. Last week it was "tea party"
Woman, you are absolutely amazing! Praise the good Lord for your gifts and God bless you for how you use them to bring such joy to this world. I 'm so happy that your precious girl had a wonderful and memorable day. Your love for your children, in all of it's details, brings tears to my eyes. It was a lovely party, the girls all had such a lovely time! Buttercup didn't want to leave, lol! Oh. my. wow! You really outdid yourself on this one, Jessica! Everything is just so fantastic. Amazing really. 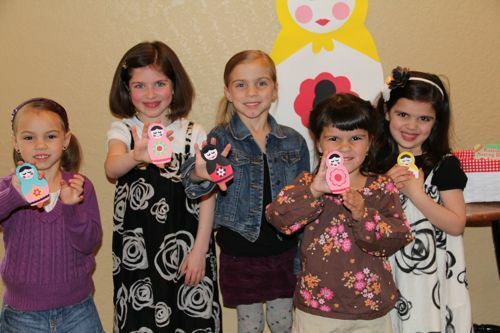 I love matryoshka nesting dolls and so do my girls. They always beg to play with their grandmother's set when we visit. And I have to say that the "dolls" you made for your boys gave me the biggest smile. You are so creative! 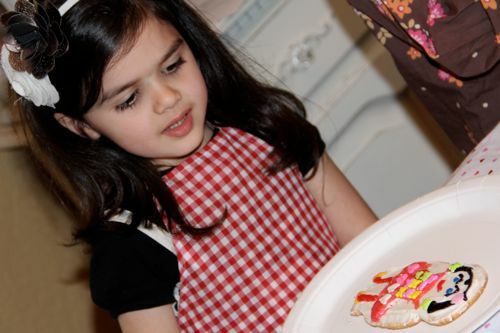 It really was such a fun party to plan, and I was wishing I would have had more time and energy to put it all together, but in the end she LOVED her birthday! You never cease to amaze me with your great ideas! Let a few things go? 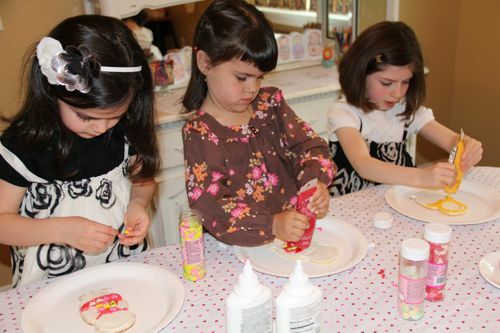 ?/ Oh my goodness that was such an adorable, creative party!!!! Adorable. I love it all. I may put that Circuit on my Christmas wish list. Amazing what it can do. So amazingly creative!!! Love the ninjas! Praying your creativity will inspire me now with our upcoming party. Do you know of anywhere else to get the ice trays? Amazon is sold out and I NEED these for my baby's first birthday in August! Funny question, but would you consider selling your mold to me? 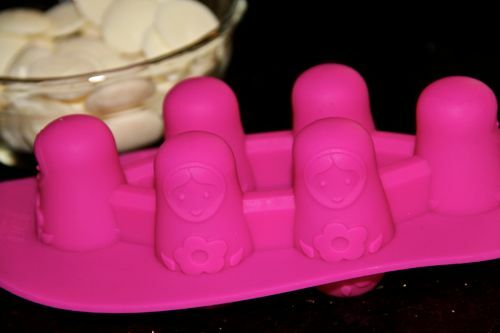 I am planning a babushka party, and absolutely adore yours! You can find me at croce emily at gmail dot com. Of course no hard feelings if not but happy to make it worth your while! Thanks and really enjoy your site!